What is “Ryzen2” ZEN+ Mobile? It is the long-awaited Ryzen2 APU mobile “Bristol Ridge” version of the desktop Ryzen 2 with integrated Vega graphics (the latest GPU architecture from AMD) for mobile devices. While on desktop we had the original Ryzen1/ThreadRipper – there was no (at least released) APU version or a mobile version – leaving only the much older designs that were never competitive against Intel’s ULV and H APUs. After the very successful launch of the original “Ryzen1”, AMD has been hard at work optimising and improving the design in order to hit TDP (15-35W) range for mobile devices. It has also added the brand-new Vega graphics cores to the APU that have been incredibly performant in the desktop space. Note that mobile versions have a single CCX (compute unit) thus do not require operating system kernel patches for best thread scheduling/power optimisation. We are comparing the graphics units of Ryzen2 mobile with competitive APUs with integrated graphics to determine whether they are good enough for modest use, especially for compute (GPGPU) use supporting the CPU. Arch Chipset GCN1.5 GT2 / EV9.5 GT2 / EV9 GT3 / EV9 All graphics cores are minor revisions of previous cores with extra functionality. ROPs / TMUs 8 / 32 8 / 16 8 / 16 16 / 24 Vega has less ROPs than GT3 but more TMUs. Speed (Min-Turbo) 300-1100 300-1000 300-1000 300-950 Turbo boost puts Vega in top position power permitting. Power (TDP) 25-35W 15-25W 15-25W 15-25W TDP is about the same for all though both Ryzen2 and CFL-U have somewhat higher TDP (25W). 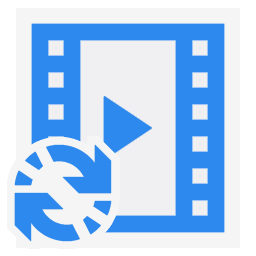 Constant Memory 2.7GB 1.6GB 1.6GB 3.2GB There is no dedicated constant memory thus a large chunk is available to use (GB) unlike a dedicated video card with very fast but small (kB). Shared (Local) Memory 32kB 64kB 64kB 64kB Intel has 2x larger shared/local memory but slow (likely non dedicated) unlike Vega. Global Memory 2.7 / 3GB 1.6 / 3.2GB 1.6 / 3.2GB 3.2 / 6.4GB About 50% of main memory can be used as global memory – thus pretty large workloads can be run. Memory System 128-bit DDR4 2400Mt/s 128-bit DDR3L 1866Mt/s 128-bit DDR3L 1866Mt/s 128-bit DDR4 2133MT/s Ryzen2’s memory controller is rated for faster data rates thus should be able to use faster (laptop) memory. 36 30 30 33 The high data rate of DDR4 can result in higher bandwidth useful for the GPU cores. L2 Cache ? 512kB 512kB 1MB L2 is comparable to Intel units. FP64/double ratio Yes, 1/16x Yes, 1/8x Yes, 1/8 Yes, 1/8x FP64 is supported and at good ratio but lower than Intel’s. 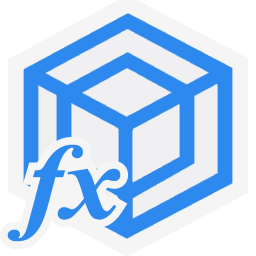 Yes, 2x Yes, 2x Yes, 2x Yes, 2x FP16 is also now supported at twice the rate – again unlike gimped dedicated cards. 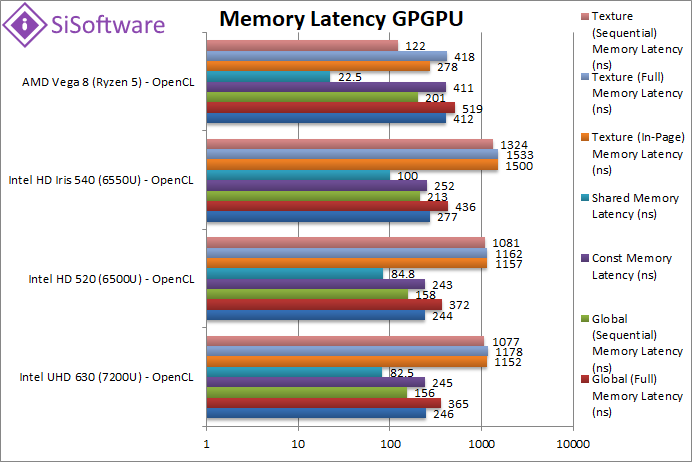 We are testing both OpenCL performance using the latest SDK / libraries / drivers from both AMD and competition. 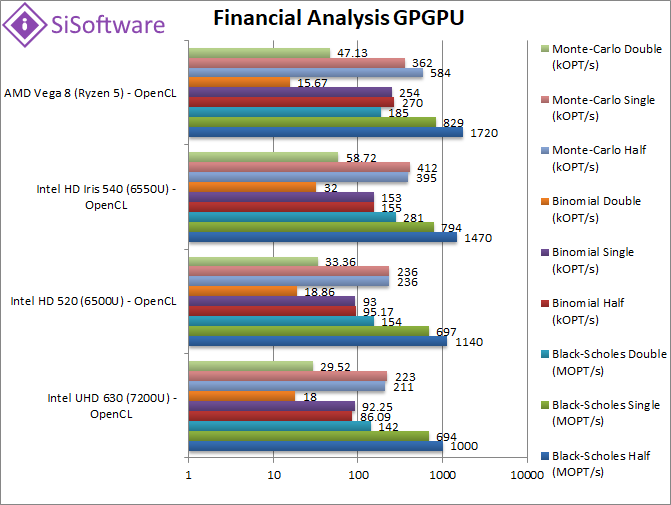 Environment: Windows 10 x64, latest Intel drivers, OpenCL 2.x. Turbo / Boost was enabled on all configurations. Mandel FP16/Half (Mpix/s) 831 927 1630 2000 [+23%] Thanks to FP16 support we see double the performance over FP32 but Vega is only 23% faster than GT3. 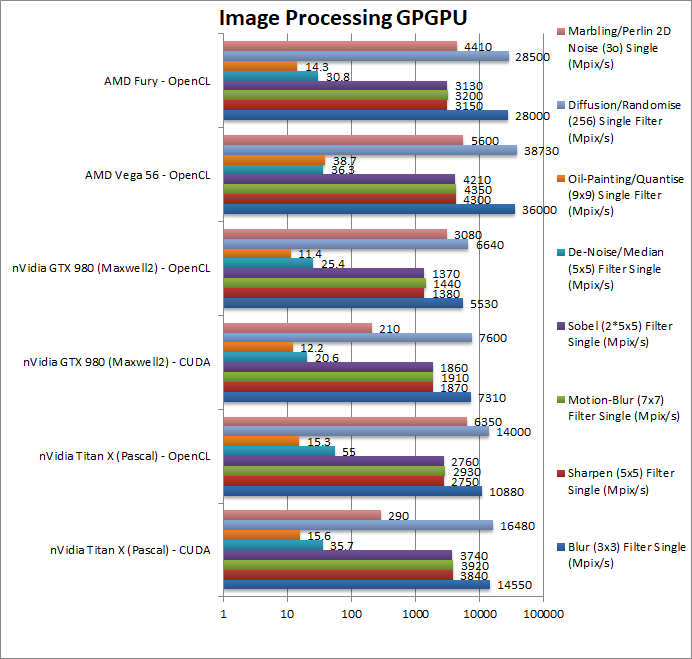 Mandel FP32/Single (Mpix/s) 476 478 865 1350 [+56%] Vega rules FP32 and is over 50% faster than GT3. 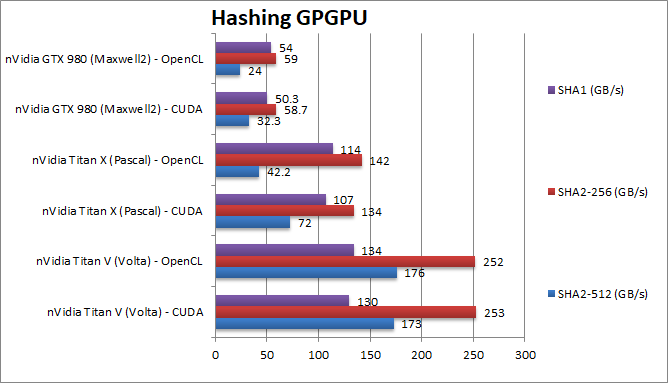 Mandel FP64/Double (Mpix/s) 113 122 209 111 [-47%] FP64 lower rate makes Vega 1/2 the speed of GT3 and only matching GT2 units. Mandel FP128/Quad (Mpix/s) 5.71 6.29 10.78 7.11 [-34%] Emulated FP128 precision depends entirely on FP64 performance thus not a lot changes. 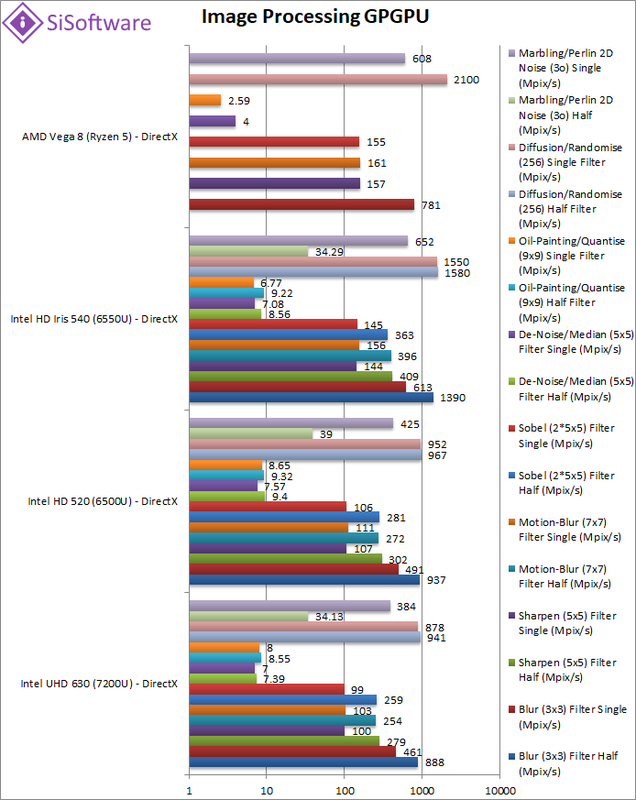 Vega is over 50% faster than Intel’s top-end Iris/GT3 graphics but only in FP32 precision – while it gains from FP16 Intel scales better reducing the lead to just 25% or so. In FP64 precision though it’s relatively low 1/16x ratio means it only ties with GT2 low-end-models while GT3 is 2x (twice) as fast. Pity. 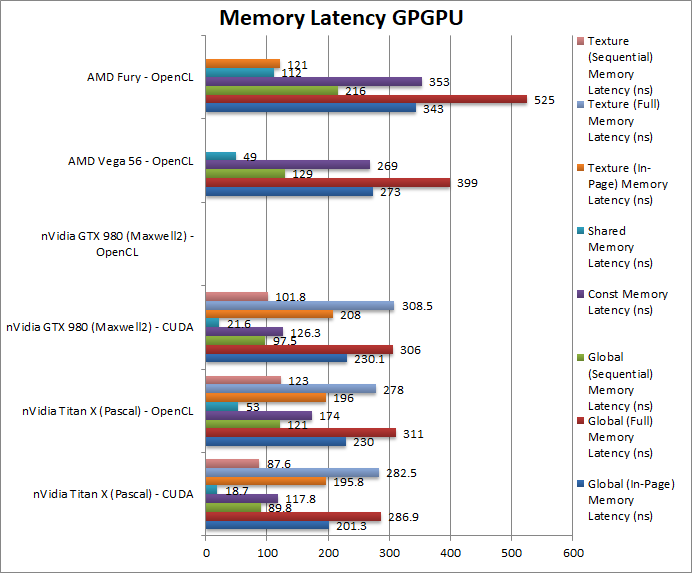 Crypto AES-256 (GB/s) 0.858 0.87 1.23 2.58 [+2.1x] No wonder AMD is crypto-king: Vega is over 2x faster than even GT3. Crypto AES-128 (GB/s) 1 1.08 1.52 3.3 [+2.17x] Nothing changes here, Vega is over 2.2x faster. Crypto SHA2-256 (GB/s) 2.72 3 4.7 14.29 [+3x] In this heavy integer workload, Vega is now 3x faster no wonder it’s used for crypto mining. Crypto SHA1 (GB/s) 6 6.64 11.59 18.77 [+62%] SHA1 is less compute intensive allowing Intel to catch up but Vega is still over 60% faster. Crypto SHA2-512 (GB/s) 1.019 1.08 1.86 3.36 [+81%] With 64-bit integer workload, Vega does better and is 80% (almost 2x) faster than GT3. 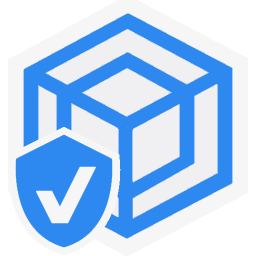 Nobody will be using integrated graphics for crypto-mining any time soon, but if you needed to (perhaps using encrypted containers, VMs, etc.) then Vega is your choice – even GT3 is left in the dust despite big improvement over low-end GT2. Intel would need at least 2x more cores to be competitive here. Black-Scholes half/FP16 (MOPT/s) 1000 1140 1470 1720 [+17%] If 16-bit precision is sufficient for financial work, Vega is 20% faster than GT3. Black-Scholes float/FP32 (MOPT/s) 694 697 794 829 [+4%] In this relatively simple FP32 financial workload Vega is just 4% faster than GT3. 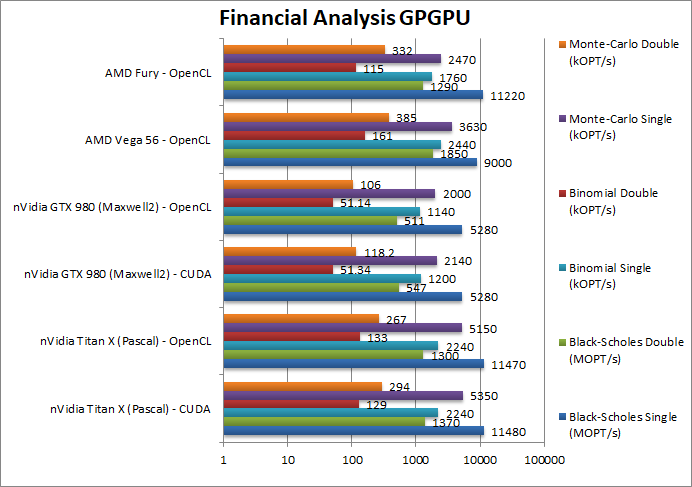 Black-Scholes double/FP64 (MOPT/s) 142 154 281 185 [-33%] Switching to FP64 precision, Vega is 33% slower than GT3. Binomial half/FP16 (kOPT/s) 86 95 155 270 [+74%] Switching to 16-bit precision allows Vega to gain over GT3 and is almost 2x faster. Binomial float/FP32 (kOPT/s) 92 93 153 254 [+66%] Binomial uses thread shared data thus stresses the internal memory sub-system, and here Vega shows its power – it is 66% faster than GT3. Binomial double/FP64 (kOPT/s) 18 18.86 32 15.67 [-51%] With FP64 precision Vega loses again vs. GT3 at 1/2 the speed and just matches GT2 units. Monte-Carlo half/FP16 (kOPT/s) 211 236 395 584 [+48%] With 16-bit precision, Vega dominates again and is almost 50% faster than GT3. Monte-Carlo float/FP32 (kOPT/s) 223 236 412 362 [-12%] Monte-Carlo also uses thread shared data but read-only thus reducing modify pressure – but Vega somehow loses against GT3. Monte-Carlo double/FP64 (kOPT/s) 29.5 33.36 58.7 47.13 [-20%] Switching to FP64 precision as expected Vega is slower. 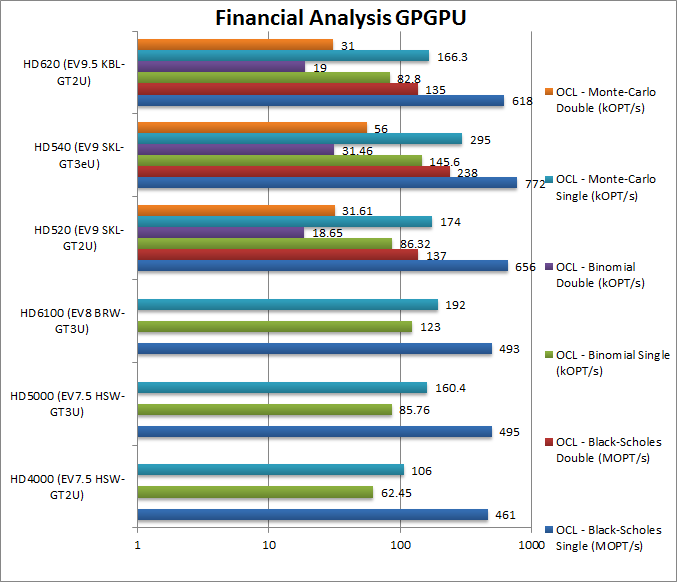 Financial algorithms perform well on Vega – at least in FP16 & FP32 precision but FP64 is too “gimped” (1/16x FP32 rate) and thus loses against GT3 despite more powerful cores. 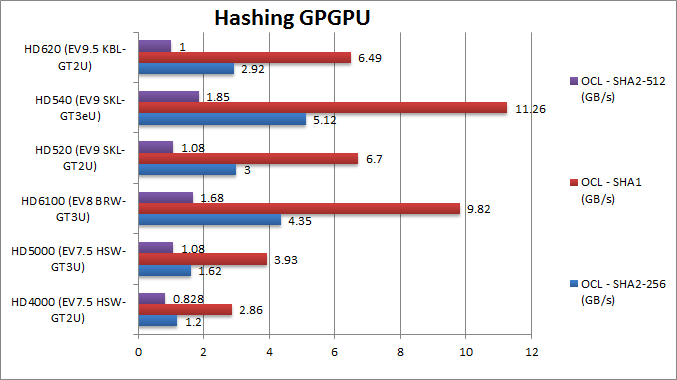 HGEMM (GFLOPS) half/FP16 127 140 236 884 [+3.75x] With 16-bit precision Vega runs away with GEMM and is almost 4x faster than GT3. SGEMM (GFLOPS) float/FP32 105 107 175 214 [+79%] GEMM makes heavy use of shared/local memory which is likely why Vega is 80% faster than GT3. DGEMM (GFLOPS) double/FP64 38.8 41.69 70 62.6 [-11%] As expected, due to gimped FP64 rate Vega falls behind GT3 but only by just 11%. HFFT (GFLOPS) half/FP16 34.2 34.7 45.85 61.34 [+34%] 16-bit precision helps reduce memory bandwidth pressure thus Vega is 34% faster. SFFT (GFLOPS) float/FP32 20.9 21.45 29.69 31.48 [+6%] FFT is memory access bound but Vega does well to beat GT3. 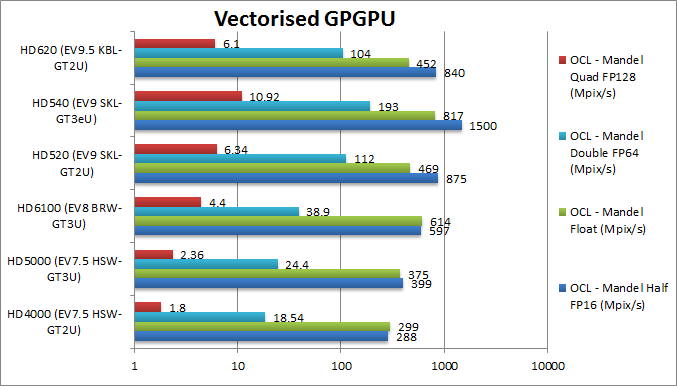 DFFT (GFLOPS) double/FP64 4.3 5.4 6.07 14.19 [+2.34x] Despite the FP64 rate, Vega manages its memory accesses better beating GT3 by over 2x (two times). 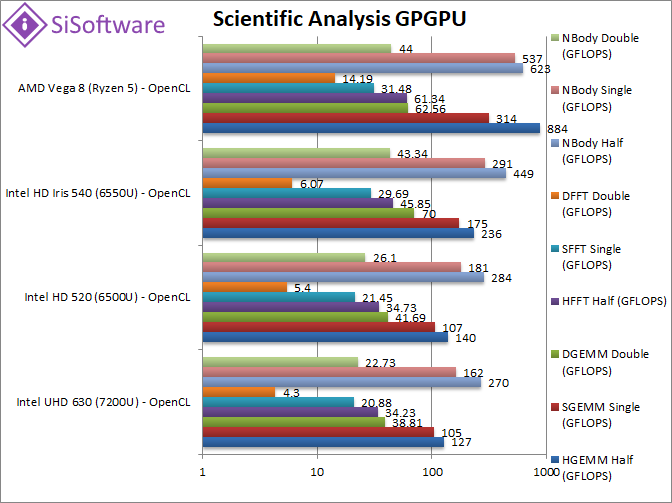 HNBODY (GFLOPS) half/FP16 270 284 449 623 [+39%] 16-bit precision still benefits N-Body and here Vega is 40% faster than GT3. SNBODY (GFLOPS) float/FP32 162 181 291 537 [+85%] Back to FP32 and Vega has a pretty large 85% lead – almost 2x GT3. 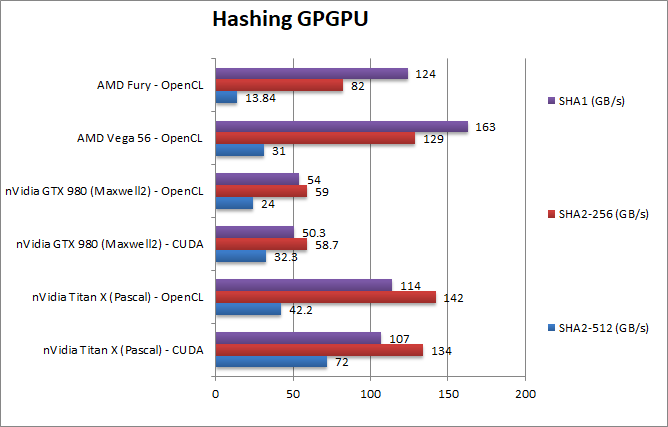 DNBODY (GFLOPS) double/FP64 22.73 26.1 43.34 44 [+2%] With FP64 precision, Vega and GT3 are pretty much tied. Vega performs well on compute heavy scientific algorithms (making heavy use of shared/local memory) and also benefits from half/FP16 to reduce memory bandwidth pressure, but FP64 rate comes back to haunt it where it loses against Intel’s GT3. Pity. Blur (3×3) Filter half/FP16 (MPix/s) 888 937 1390 2273 [+64%] With 16-bit precision Vega doubles its lead to 64% over GT3 despite its gain over FP32. Blur (3×3) Filter single/FP32 (MPix/s) 461 491 613 781 [+27%] In this 3×3 convolution algorithm, Vega does well but only 30% faster than GT3. Sharpen (5×5) Filter half/FP16 (MPix/s) 279 302 409 582 [+42%] Again a huge gain by using FP16, over 40% faster than GT3. 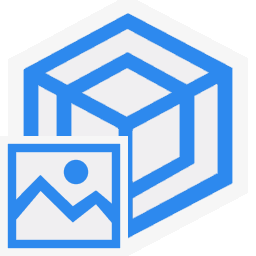 Sharpen (5×5) Filter single/FP32 (MPix/s) 100 107 144 157 [+9%] Same algorithm but more shared data reduces the gap to 9%. Motion Blur (7×7) Filter half/FP16 (MPix/s) 254 272 396 619 [+56%] Large gain again by switching to FP16 with 3x performance over FP32. Motion Blur (7×7) Filter single/FP32 (MPix/s) 103 111 156 161 [+3%] With even more shared data the gap falls to just 3%. Edge Detection (2*5×5) Sobel Filter half/FP16 (MPix/s) 259 281 363 595 [+64%] Another huge gain and over 3x improvement over FP32. Edge Detection (2*5×5) Sobel Filter single/FP32 (MPix/s) 99 106 145 155 [+7%] Still convolution but with 2 filters – the gap is similar to 5×5 – Vega is 7% faster. Noise Removal (5×5) Median Filter half/FP16 (MPix/s) 7.39 9.4 8.56 7.688 [-18%] Big gain but not enough to beat GT3 here. Noise Removal (5×5) Median Filter single/FP32 (MPix/s) 7 7.57 7.08 4 [-47%] Vega does not like this algorithm (lots of branching causing divergence) and is 1/2 GT3 speed. Oil Painting Quantise Filter half/FP16 (MPix/s) 8.55 9.32 9.22 <BSOD> This test would cause BSOD; we are investigating. Oil Painting Quantise Filter single/FP32 (MPix/s) 8 8.65 6.77 2.59 [-70%] Vega does not like this algorithms either (complex branching) and neither does GT3. Diffusion Randomise (XorShift) Filter half/FP16 (MPix/s) 941 967 1580 2091 [+32%] In order to prevent artifacts most of this test runs in FP32 thus not much gain here. Diffusion Randomise (XorShift) Filter single/FP32 (MPix/s) 878 952 1550 2100 [+35%] This algorithm is 64-bit integer heavy allowing Vega 35% better performance over GT3. Marbling Perlin Noise 2D Filter half/FP16 (MPix/s) 341 390 343 1046 [+2.5x] Switching to FP16 makes a huge difference to Vega which is over 2x faster. Marbling Perlin Noise 2D Filter single/FP32 (MPix/s) 384 425 652 608 [-7%] One of the most complex and largest filters, Vega is a bit slower than GT3 by 7%. 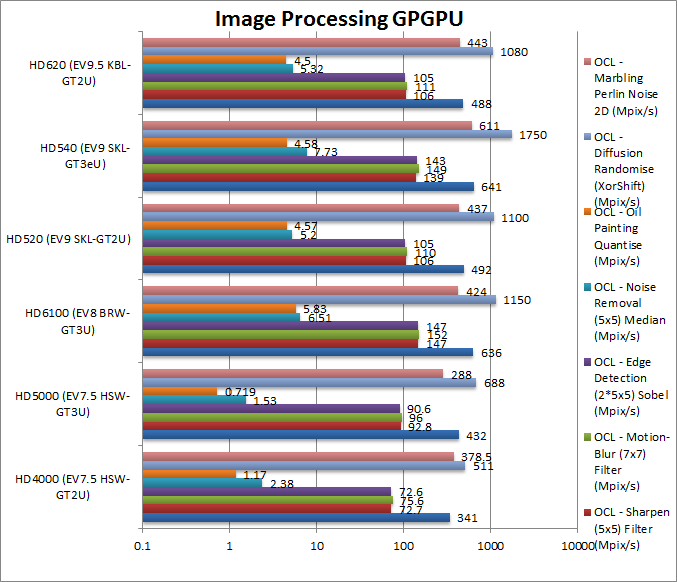 For image processing Vega generally performs well in FP32 beating GT3 hands down; but there are a few algorithms that may need to be optimised for it that don’t perform as well as expected. 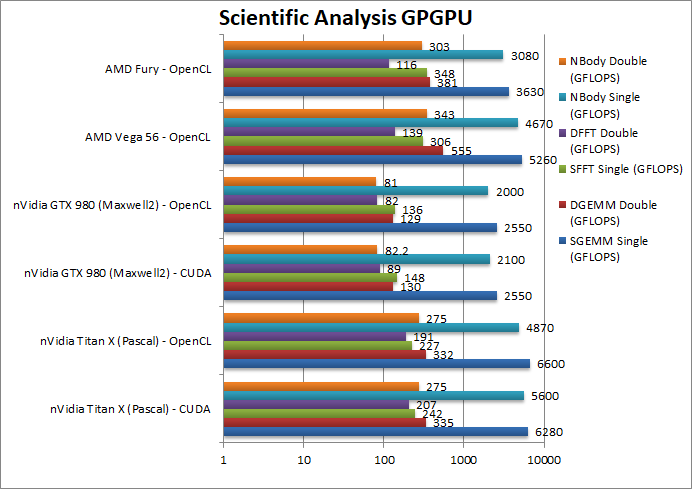 Switching to FP16 though doubles/triples scores – thus Vega may be starved of memory. Results Interpretation: Higher values (MB/s, etc.) mean better performance. Lower time values (ns, etc.) mean better performance. Internal Memory Bandwidth (GB/s) 12.17 21.2 24 27.32 [+14%] With higher speed DDR4 memory, Vega has 14% more bandwidth. Upload Bandwidth (GB/s) 6 10.4 11.7 4.74 [-60%] The GPU<>CPU link seems a bit slow here at 1/2 bandwidth of Intel. Download Bandwidth (GB/s) 6 10.5 11.75 5 [-57%] Download bandwidth shows a similar issue, 1/2 bandwidth expected. All designs have to rely on the shared memory controller and Vega performs as expected with good internal bandwidth due to higher speed DDR4 memory. But – transfer up/down speeds are disappointing possibly due to the driver as “zero-copy” mode should be engaged and working on such transfers (APU mode). Global (In-Page Random Access) Latency (ns) 246 244 288 412 [+49%] Similarly with CPU data latencies, global “in-page/random” (aka “TLB hit”) latencies are a bit high though not by a huge amount. Global (Full Range Random Access) Latency (ns) 365 372 436 519 [+19%] Due to faster memory clock but increased timings “full/random” latencies appear a bit higher. Global (Sequential Access) Latency (ns) 156 158 213 201 [-6%] Sequential access latencies are less than competition by 6%. 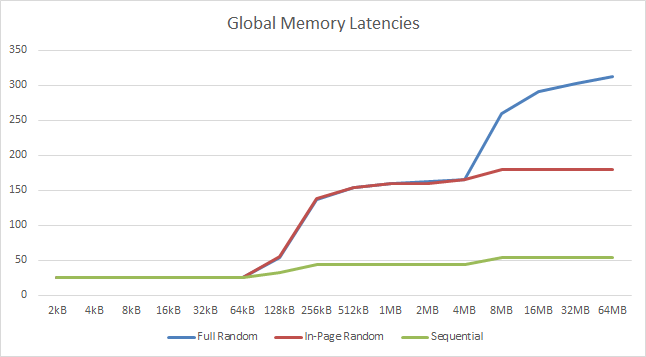 Constant Memory (In-Page Random Access) Latency (ns) 245 243 252 411 [+63%] None have dedicated constant memory thus we see a similar picture to global memory: somewhat high latencies. Shared Memory (In-Page Random Access) Latency (ns) 82 84 100 22.5 [1/5x] Vega has dedicated shared/local memory and it shows – it’s about 5x faster than Intel’s designs. 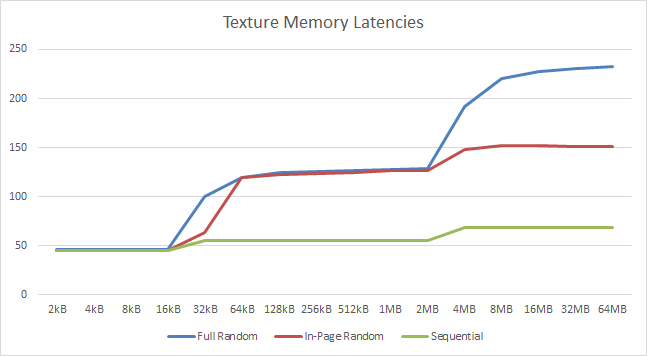 Texture (In-Page Random Access) Latency (ns) 1152 1157 1500 278 [1/5x] Texture access is also very fast on Vega, with latencies 5x lower (aka 1/5) than Intel’s designs. Texture (Full Range Random Access) Latency (ns) 1178 1162 1533 418 [1/3x] Even full/random accesses are fast, 3x (three times) faster than Intel’s. Texture (Sequential Access) Latency (ns) 1077 1081 1324 122 [1/10x] With sequential access we see a crazy 10x lower latency as if AMD uses prefetchers and Intel does not. As we’ve seen in Ryzen 2’s data latency tests – “in-page/random” latencies are higher than competition but the rest are comparative, with sequential (prefetched) latencies especially small. 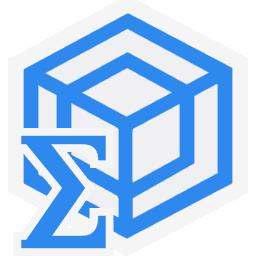 But dedicated shared/local memory is far faster (5x) and texture accesses are also very fast (3-5x) which should greatly help algorithms making use of them. 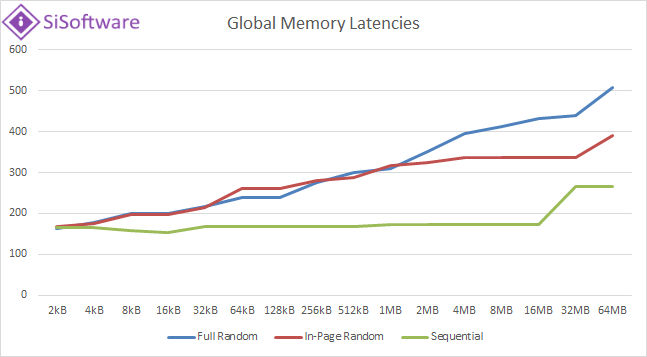 Plotting the global (or constant) memory latencies together we see that the “in-page/random” access latencies should perhaps peak somewhat lower but still nothing close to what we’ve seen in the (CPU) data memory latencies article. It is not very clear (unlike the texture latencies graph) where the caches are located. The texture latencies graph is far clearer where we can see each level’s caches; unlike the global (or constant) latencies we see “in-page/random” latency peak and hold at a somewhat lower level (4MB). Vega mobile, as its desktop big siblings, is undoubtedly powerful and a good upgrade from the older integrated GPU cores; it also supports modern features like half/FP16 compute (which needs vectorisation what the driver reports as “optimised width”) and relishes complex algorithms making use of shared/local memory which is efficient. 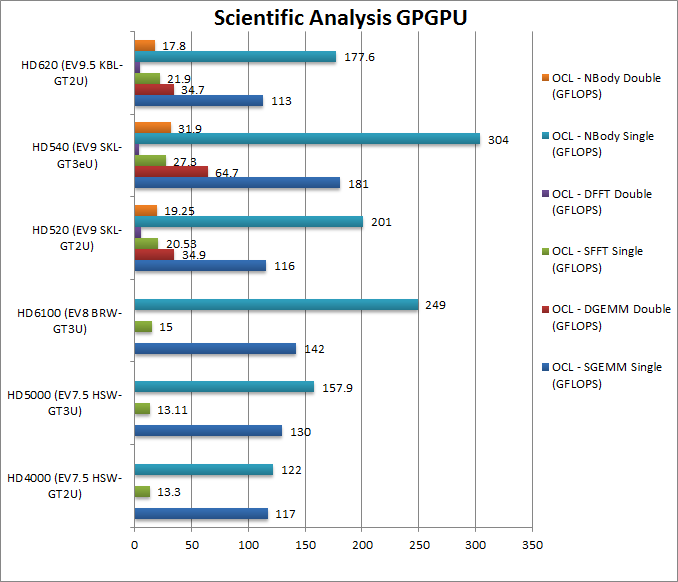 However Intel’s GT3 EV9.x can get close to it in some workloads and due to better FP64 ratio (1/8x vs 1/16x) even beat it in most FP64 precision tests which is somewhat disappointing. 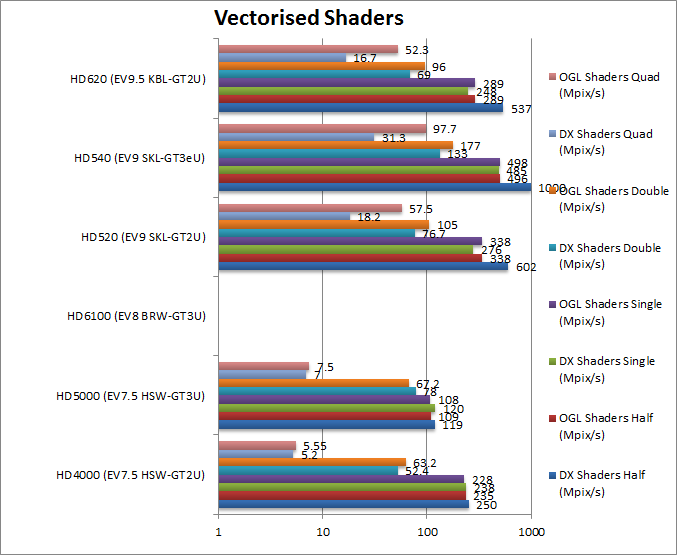 Luckily for AMD, GT3 variant is very rare and thus Vega has an easy job defeating GT2 in just about all tests; but it shows that should Intel “get serious” and continue to improve integrated graphics (and CPUs) like they used to do before Skylake (SKL/KBL) – AMD might have more serious competition on its hands. Note that until recently (2019) Ryzen2 mobile APUs were not supported by AMD’s main drivers (“Adrenalin”) and had to rely on pretty old OEM (HP, etc.) drivers that were somewhat problematic especially with Windows 10 changing every 6 months while the drivers were almost 1 year old. Thankfully this has now changed and users (and us) can benefit from updated, stable and performant drivers. In any case if you want a laptop/ultraportable with just an APU and no dedicated graphics, then Vega is pretty much your only choice which means a Ryzen2 system. That pretty much means it is worthy of a recommendation. It is the latest high-end “pro-sumer” card from nVidia with the next-generation “Volta” architecture, the next generation to the current “Pascal” architecture on the Series 10 cards. Based on the top-end 100 chipset (not lower 102 or 104) it boasts full speed FP64/FP16 performance as well as brand-new “tensor cores” (matrix multipliers) for scientific and deep-learning workloads. It also comes with on-chip HBM2 (high-bandwidth) memory unlike more traditional GDDRX stand-alone memory. For this reason the price is also far higher than previous Titan X/XP cards but considering the features/performance are more akin to “Tesla” series it would still be worth it depending on workload. 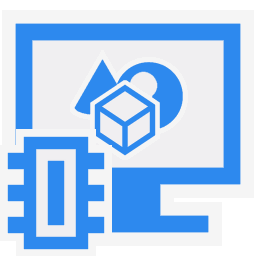 While using the additional cores provided in FP64/FP16 workloads is automatic – save usual code optimisations – tensor cores support requires custom code and existing libraries and apps need to be updated to make use of them. It is unknown at this time if consumer cards based on “Volta” will also include them. As they support FP16 precision only, not workloads may be able to use them – but DL (deep learning) and AI (artificial intelligence) are generally fine using lower precision thus for such tasks it is ideal. We are comparing the top-of-the-range Titan V with previous generation Titans and competing architectures with a view to upgrading to a mid-range high performance design. Cores (CU) / Threads (SP) 80 / 5120 28 / 3584 16 / 2048 The V boasts 80 CU units but these contain 64 FP32 units only not 128 like lower-end chips thus equivalent with 40. FP32 / FP64 / Tensor Cores 5120 / 2560 / 640 3584 / 112 / no 2048 / 64 / no Titan V is the only one with tensor cores and also huge amount of FP64 cores that Titan X simply cannot match; it also has full speed FP16 support. Speed (Min-Turbo) 1.2GHz (135-1.455) 1.531GHz (139-1910) 1.126GHz (135-1.215) Slightly lower clocked than the X it will will make up for it with sheer CU units. Power (TDP) 300W 250W (125-300) 180W (120-225) TDP increases by 50W but it is not unexpected considering the additional units. 96 / 320 96 / 224 64 / 128 Not a “gaming card” but while ROPs stay the same the number of TMUs has increased – likely required for compute tasks using textures. 652 512 224 In addition to the modest bandwidth increase, latencies are also meant to have decreased by a good amount. L2 Cache 4.5MB 3MB 2MB L2 cache has gone up by about 50% to feed all the cores. 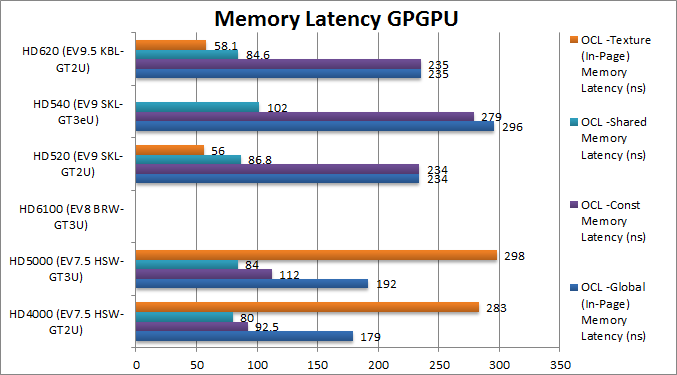 1/2 1/32 1/32 For FP64 workloads the V has huge advantage as consumer and previous Titan X had far less FP64 units. 2x 1/64 n/a The V has an even bigger advantage here with over 128x more units for FP16 tasks like DL and AI. 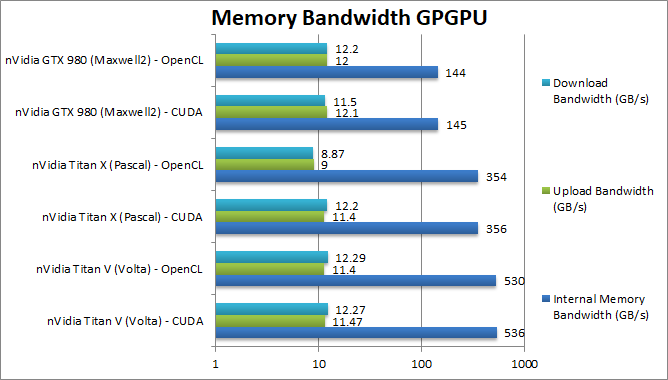 We are testing both CUDA native as well as OpenCL performance using the latest SDK / libraries / drivers. Mandel FP32/Single (Mpix/s) 22,400 [+25%] / 20,000 17,870 / 16,000 7,000 / 6,100 Right off the bat, the V is just 25% faster than the X some optimisations may be required. Mandel FP16/Half (Mpix/s) 33,300 [135x] / n/a 245 / n/a n/a For FP16 workloads the V shows its power: it is an astonishing 135 *times* (times not %) faster than the X.
Mandel FP64/Double (Mpix/s) 11,000 [+16.7x] / 11,000 661 / 672 259 / 265 For FP64 precision workloads the V shines again, it is 16 times faster than the X.
Mandel FP128/Quad (Mpix/s) 458 [+17.7x] / 455 25 / 24 10.8 / 10.7 With emulated FP128 precision the V is again 17 times faster. 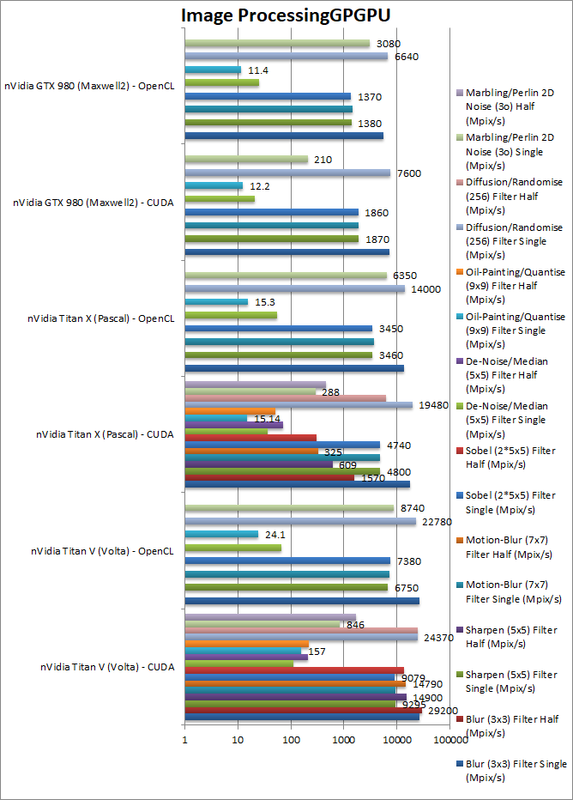 As expected FP64 and FP16 performance is much improved on Titan V, with FP64 over 16x times faster than the X; FP16 performance is over 50% faster than FP32 performance making it almost 2x faster than Titan X. 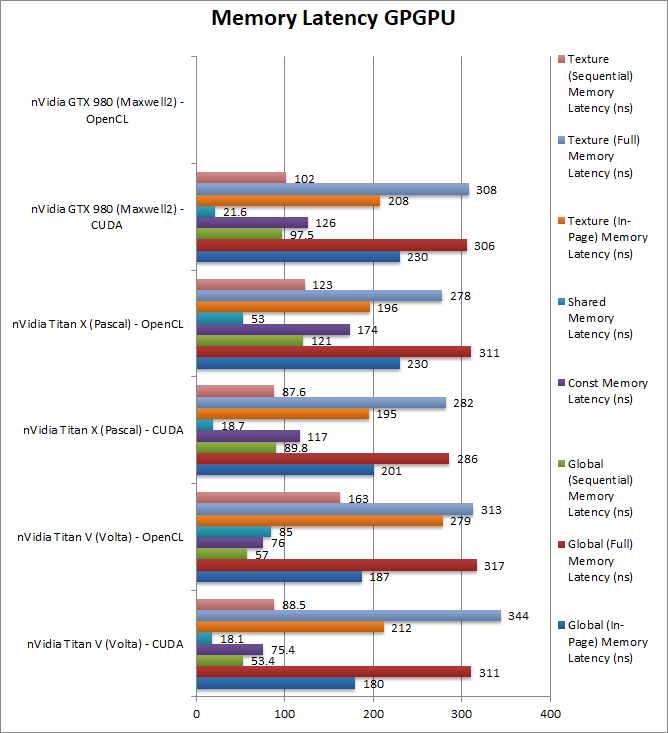 For workloads that need it, the performance of Titan V is stellar. Crypto AES-256 (GB/s) 71 [+79%] / 87 40 / 38 16 / 16 Titan V is almost 80% faster than the X here a significant improvement. Crypto AES-128 (GB/s) 91 [+75%] / 116 52 / 51 23 / 21 Not a lot changes here, with the V still 7% faster than the X.
Crypto SHA2-256 (GB/s) 253 [+89%] / 252 134 / 142 58 / 59 In this integer workload, Titan V is almost 2x faster than the X. 107 / 114 50 / 54 SHA1 is mysteriously slower than SHA256 and here the V is just 21% faster. Crypto SHA2-512 (GB/s) 173 [+2.4x] / 176 72 / 42 32 / 24 With 64-bit integer workload, Titan V shines again – it is almost 2.5x (times) faster than the X! Historically, nVidia cards have not been tuned for integer workloads, but Titan V is almost 2x faster in 32-bit hashing and almost 3x faster in 64-bit hashing than the older X. For algorithms that use integer computation this can be quite significant. 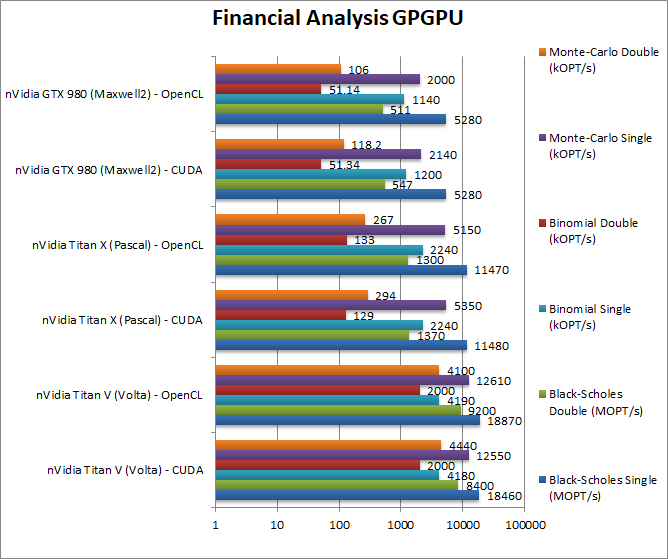 11,480 / 11,470 5,280 / 5,280 Titan V manages to be 60% faster in this FP32 financial workload. 1,370 / 1,300 547 / 511 Switching to FP64 code, the V is over 6x (times) faster than the X. 2,240 / 2,240 1,200 / 1,140 Binomial uses thread shared data thus stresses the SMX’s memory system: but the V is 80% faster than the X. 129 / 133 51 / 51 With FP64 code the V is much faster – 15x (times) faster! 5,350 / 5,150 2,140 / 2,000 Monte-Carlo also uses thread shared data but read-only thus reducing modify pressure – here the V is over 2x faster than the X and that is FP32 code! 294 / 267 118 / 106 Switching to FP64 the V is again over 15x (times) faster! For financial workloads, the Titan V is significantly faster, almost twice as fast as Titan X on FP32 but over 15x (times) faster on FP64 workloads. If time is money, then this can be money well-spent! 6,280 / 6,600 2,550 / 2,550 Without using the new “tensor cores”, Titan V is about 60% faster than the X.
DGEMM (GFLOPS) double/FP64 3,830 [+11.4x] / 3,920 335 / 332 130 / 129 With FP64 precision, the V crushes the X again it is 11x (times) faster. SFFT (GFLOPS) float/FP32 605 [+2.5x] / 391 242 / 227 148 / 136 FFT allows the V to do even better – no doubt due to HBM2 memory. DFFT (GFLOPS) double/FP64 280 [+35%] / 245 207 / 191 89 / 82 We may need some optimisations here, otherwise the V is just 35% faster. 5,600 / 4,870 2,100 / 2,000 N-Body simulation also needs some optimisations as the V is just 15% faster. 275 / 275 82 / 81 With FP64 precision, the V again crushes the X – it is 15x faster. 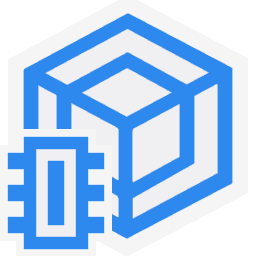 The scientific scores are a bit more mixed – GEMM will require code paths to take advantage of the new “tensor cores” and some optimisations may be required – otherwise FP64 code simply flies on Titan V.
17,860 / 13,680 7,310 / 5,530 In this 3×3 convolution algorithm, Titan V is 50% faster than the X. Convolution is also used in neural nets (CNN) thus performance here counts. 1,570 n/a With FP16 precision, Titan V shines it is 18x (times faster than X) but 12% faster than FP32. 4,800 / 3,460 1,870 / 1,380 Same algorithm but more shared data allows the V to be almost 2x faster than the X. 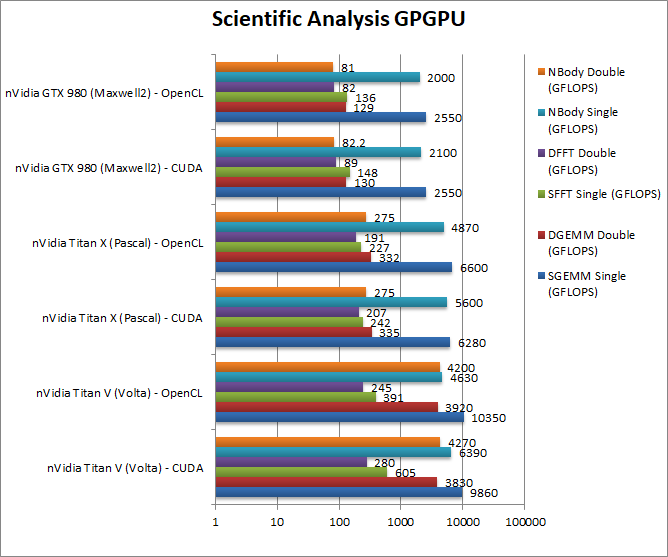 609 n/a With FP16 Titan V is almost 25x (times) faster than X and also 60% faster than Fp32. 4,830 / 3,620 1,910 / 1,440 Again same algorithm but even more data shared the V is 2x faster than the X.
Motion-Blur (7×7) Filter half/FP16 (MPix/s) 14,790 [+45x] 325 n/a With FP16 the V is now45x (times) faster than the X showing the usefulness of FP16 support. 4,740 / 3450 1,860 / 1,370 Still convolution but with 2 filters – Titan V is almost 2x faster again. 309 n/a Just as we seen above, the V is an astonishing 44x (times) faster than the X, and also ~20% faster than FP32 code. 36 / 55 20 / 25 Different algorithm but here the V is even faster, 3x faster than the X! 15 / 15 12 / 11 Without major processing, this filter flies on the V – it is 10x faster than the X. Oil Painting Quantise Filter half/FP16 (MPix/s) 215 [+4x] 50 FP16 precision is “just” 4x faster but it is also ~40% faster than FP32. Diffusion Randomise (XorShift) Filter single/FP32 (MPix/s) 24,370 / 22,780 [+25%] 19,480 / 14,000 7,600 / 6,640 This algorithm is 64-bit integer heavy and here Titan V is 25% faster than the X.
Diffusion Randomise (XorShift) Filter half/FP16 (MPix/s) 24,180 [+4x] 6,090 FP16 does not help a lot here, but still the V is 4x faster than the X.
Marbling Perlin Noise 2D Filter single/FP32 (MPix/s) 846 [+3x] / 874 288 / 635 210 / 308 One of the most complex and largest filters, Titan V does very well here, it is 3x faster than the X. 461 n/a Switching to FP16, the V is almost 4x (times) faster than the X and over 2x faster than FP32 code. 356 / 354 145 / 144 HBM2 brings about 50% more raw bandwidth to feed all the extra compute cores, a significant upgrade. 11.4 / 9 12.1 / 12 Still using PCIe3 x16 there is no change in upload bandwidth. Roll on PCIe4! 12.2 / 8.9 11.5 / 12.2 Again no significant difference but we were not expecting any. 201 / 230 230 From the start we see global latency accesses reduced by 10%, not a lot but will help. 286 / 311 306 Full range random accesses do seem to be 9% slower which may be due to the architecture. Global (Sequential Access) Latency (ns) 53 [-40%] / 57 89 / 121 97 However, sequential accesses seem to have dropped a huge 40% likely due to better prefetchers on the Titan V.
Constant Memory (In-Page Random Access) Latency (ns) 75 [-36%] / 76 117 / 174 126 Constant memory latencies also seem to have dropped by almost 40% a great result. 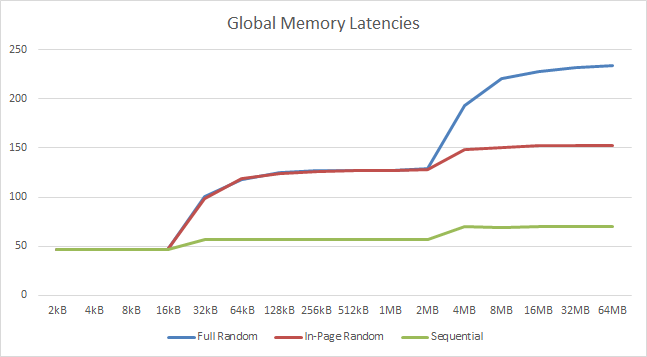 Shared Memory (In-Page Random Access) Latency (ns) 18 / 85 18 / 53 21 No significant change in shared memory latencies. 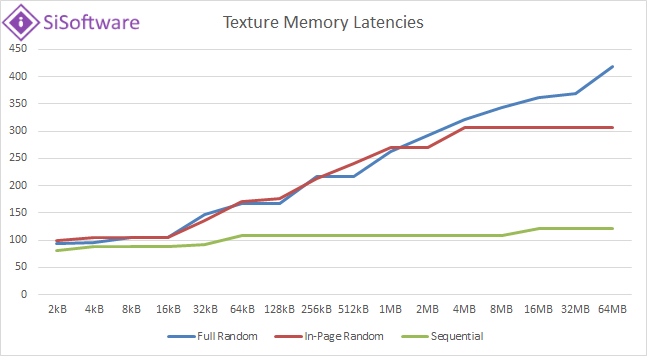 Texture (Full Range Random Access) Latency (ns) 344 [+22%] / 313 282 / 278 308 As we’ve seen with global memory, we see increased latencies here by about 20%. Texture (Sequential Access) Latency (ns) 88 / 163 87 /123 102 With sequential access there is no appreciable delta in latencies. 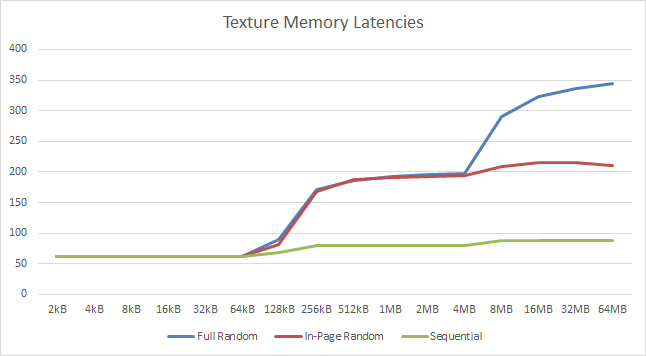 We see L1 cache effects between 64-128kB tallying with an L1D of 96kB – 4x more than what we’ve seen on Titan X (at 16kB). The other inflexion is at 4MB – matching the 4.5MB L2 cache size – which is 50% more than what we saw on Titan X (at 3MB). 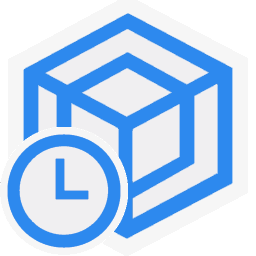 As with global memory we see the same L1D (64kB) and L2 (4.5MB) cache affects with similar latencies. Both are significant upgrades over Titan X’ caches. Titan V’s memory performance does not disappoint – HBM2 obviously brings large bandwidth increase – latency depends on access pattern, when prefetchers can engage they are much lowers but in random accesses out-of-page they are a big higher but nothing significant. We’re also limited by the PCIe3 bus for transfers which requires judicious overlap of memory transfers and compute to keep the cores busy. “Volta” architecture does bring good improvements in FP32 performance which we hope to see soon in consumer (Series 11?) graphics cards – as well as lower-end Titan cards. But here (on Titan V) we have the top-end chip with full-power FP64 and FP16 units more akin to Tesla which simply power through any and all algorithms you can throw at them. This is really the “Titan” you were looking for and upgrading from the previous Titan X (Pascal) is a huge upgrade admittedly for quite a bit more money. If you have workloads that requires double/FP64 precision – Titan V is 15-16x times faster than Titan X – thus great value for money. If code can make do with FP16 precision then you can gain up to 2x extra performance again – as well as save storage for large data-sets – again Titan X cannot cut it here running at 1/64 rate. We have not yet shown tensor core performance which is an additional reason for choosing such a card – if you have code that can make use of them you can gain an extra 16x (times) performance that really puts Titan V heads and shoulders over the Titan X. All in all Titan V is a compelling upgrade if you need more power than Titan X and are (or thinking of) using multiple cards – there is simply no point. One Titan V can replace 4 or more Titan X cards on FP64 or FP16 workloads and that is before you make any optimisations. Obviously you are still “stuck” with 12GB memory and PCIe bus for transfers but with judicious optimisations this should not impact performance significantly. London, UK, 30th November 2009 – SiSoftware releases its suite of OpenCL GPGPU (General Purpose Graphics Processor Unit) benchmarks as part of SiSoftware Sandra 2010, the latest version of our award-winning utility, which includes remote analysis, benchmarking and diagnostic features for PCs, servers, and networks. 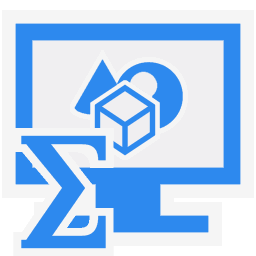 At SiSoftware we are constantly looking out for new technologies with the aim to understand how those technologies can best be benchmarked and analysed. 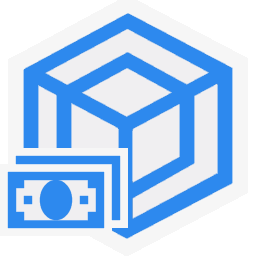 We believe that the industry is seeing a shift from the model where heavy computational workload is processed on a traditional CPU to a model that uses the GPGPU or a combination of GPU and CPU; in a wide range of applications developers are using the power of GPGPU to aid business analysis, games, graphics and scientific applications. As certain tasks or workloads may still perform better on traditional CPU, we see both CPU and GPGPU benchmarks to be an important part of performance analysis. 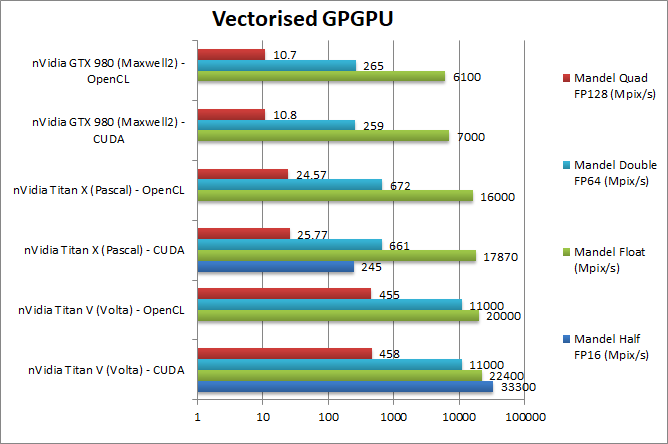 Having launched the GPGPU Benchmarks with SiSoftware Sandra 2009 with support for AMD CTM/STREAM and nVidia CUDA, we have now ported the benchmark suite to OpenCL. OpenCL is an open standard for running parallel tasks on GPUs, CPUs and hardware accelerators using the same code – unlike proprietary solutions. 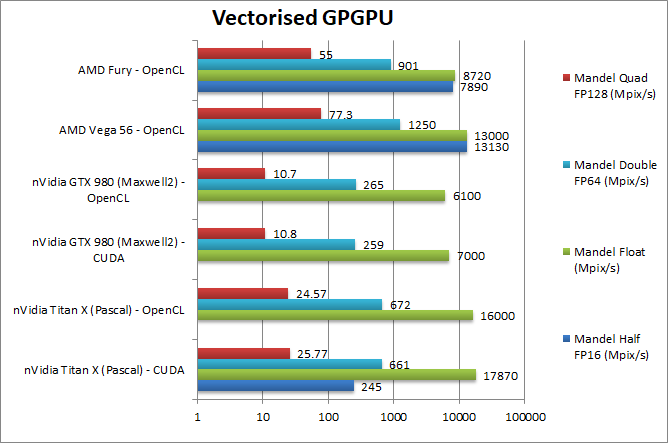 We believe OpenCL will become “the standard” for programming parallel workloads in the future, thus we have ported all our GPGPUs benchmarks to OpenCL. Computational performance: in simple terms how fast it can crunch numbers. It follows the same style as the CPU Multi-Media benchmark using fractal generation as its workload. 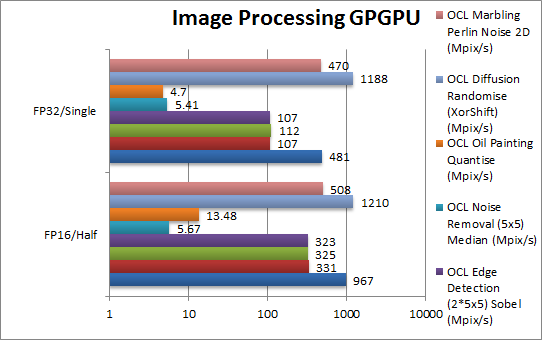 This allows the user to see the power of the GPGPU in solving a workload thus far exclusively performed on a CPU. 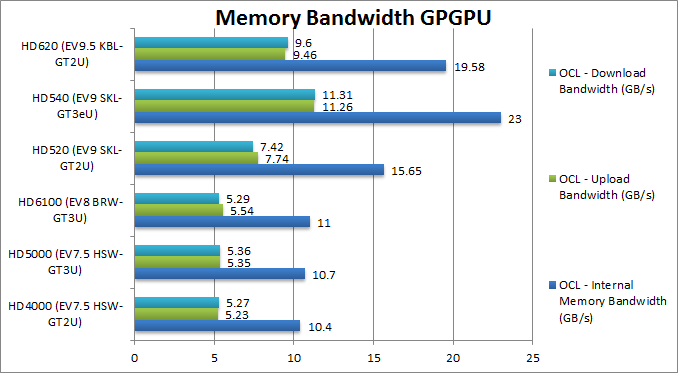 Memory performance: this analyses how fast data can be transferred to and from the GPGPU. No matter how fast the processing, ultimately the end result will be affected by memory performance. GPU + CPU parallel execution supported, up to 8 devices in total. Different models of GPUs supported, including integrated GPU + dedicated GPUs. Multi-GPUs supported, up to 8 in parallel. With each release, we continue to add support and compatibility for the latest technologies. SiSoftware works with hardware vendors to ensure the best support for new emerging hardware. 1 Available as Beta at this time, performance cannot be guaranteed. 2 By special arrangement; Enterprise versions only. 3 Not all languages available at publication, will be released later. To update your existing commercial version, please contact your distributor (sales support). For more details, and to download the Lite version, please click here. SiSoftware, founded in 1995, is one of the leading providers of computer analysis, diagnostic and benchmarking software. The flagship product, known as “SANDRA”, was launched in 1997 and has become one of the most widely used products in its field. Nearly 700 worldwide IT publications, magazines and review sites use SANDRA to analyse the performance of today’s computers. Over 9,000 on-line reviews of computer hardware that use SANDRA are catalogued on our website alone. Since launch, SiSoftware has always been at the forefront of the technology arena, being among the first providers of benchmarks that show the power of emerging new technologies such as multi-core, GPGPU, OpenCL, DirectCompute, x64, ARM, MIPS, NUMA, SMT (Hyper-Threading), SMP (multi-threading), AVX3, AVX2, AVX, FMA4, FMA, NEON, SSE4.2, SSE4.1, SSSE3, SSE3, SSE2, SSE, Java and .NET.